We traveled to Portugal with an almost singular goal. 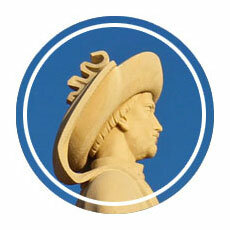 Sure, we wanted to learn about the country’s history, try the food, and meet the people. But really, one travel goal rose above the rest: we wanted to try the wine. If you’re wondering just what is port wine, it is a sweet, fortified wine often served with dessert (or for dessert). Port is often thicker and heavier than the wines you’re probably used to sipping, and it’s higher in alcohol, which means it’s usually consumed in small quantities. 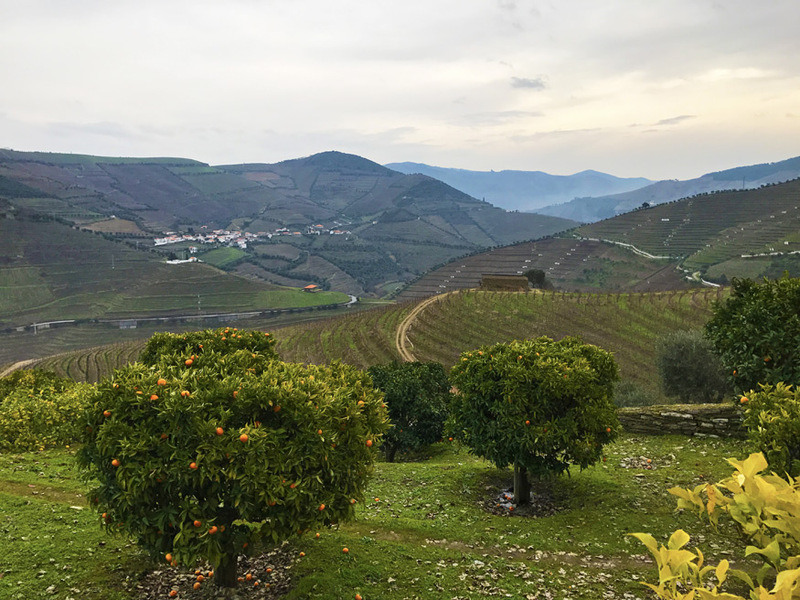 We’ve tried port-style wine—only wine made in Portugal can be called port—during tastings around the world, and honestly it’s never been a particular favorite for either of us. Sometimes port-style wines become too thick, and we’ve tried more than one that simply tasted like sweet cough syrup. That said, we didn’t want to write port off completely before trying the real thing. And as we learned in both Santiago and Dubrovnik, there’s no more relaxing way to end a trip than with a day visiting wineries. 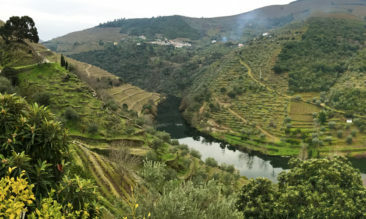 In addition to being the birthplace of port wine, the terraced vineyards of the Douro Valley also hold the distinction of being a UNESCO World Heritage Site, a listing it earned from its status as one of the world’s oldest regulated wine regions. 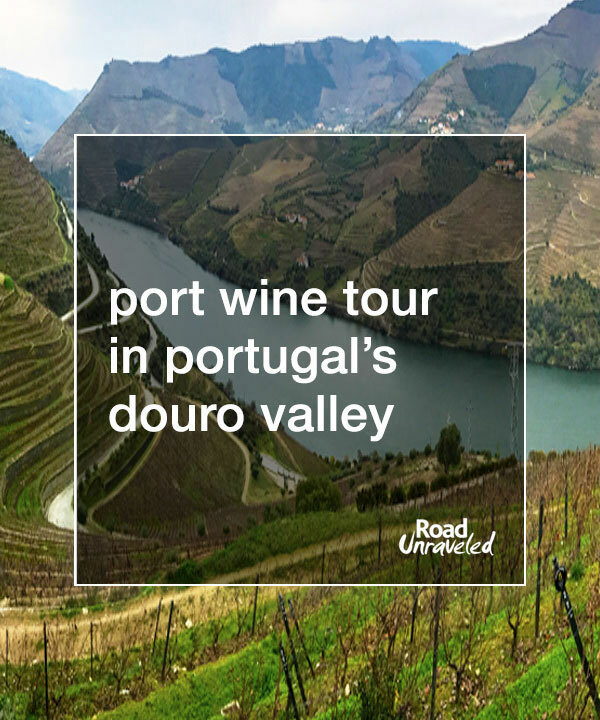 We booked a day-long trip to the Douro Valley to sample port at three vineyards. It was almost 9:20 when our tour guide rushed into our hotel lobby, full of apologies. He was 20 minutes late, and really, we weren’t bothered by the delay; it wasn’t the longest we had waited for a tour to begin. We were the last to be picked up, so after a few quick greetings to the others we joined we were finally underway. The drive to the Douro Valley takes a bit more than an hour and a half, which isn’t a very long time. Unless you’re trapped in a van with the passengers who shared our ride. While I won’t summarize the trip, I will use this opportunity to share a quick public service announcement. As a tourist anywhere—but especially in a foreign country—it’s important to be aware of your surroundings and act with a certain amount of decorum. When you travel, you are an ambassador from your home country, which means you represent everyone with whom you share a national identity. As we sat in our seats, a captive audience for some very vulgar language and inappropriate conversations that filled the van, we were mortified. As it turned out, four of the six other passengers were college friends from the United States on holiday in Portugal, and they felt no shame as they discussed their nightly escapades in no uncertain detail. I was embarrassed for them, and I was sorry for our tour guide, who didn’t seem to appreciate their choice of language and conversation topics. When you’re in your hotel room or even in a crowded bar, talk about anything you like, but when it comes to an otherwise quiet van full of strangers… all I can say is keep your audience in mind and think about how you are representing yourself and your country. That’s enough ranting. Onto the wine! 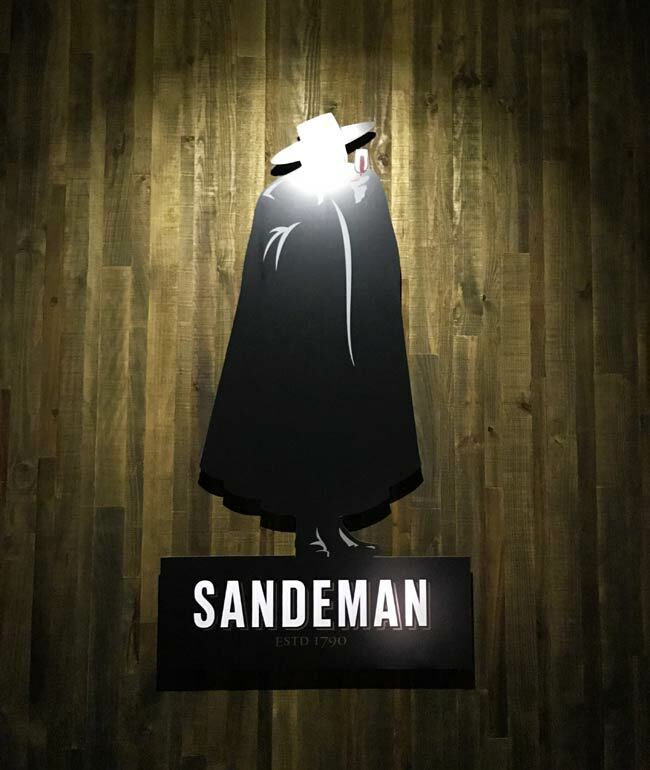 Our first stop was Quinta do Seixo, home to Sandeman and set among a truly picturesque scene of rolling hills. We took an interesting tour led by a charismatic guide; she started our tour with a 10-minute video that provided some history and context for the rest of the tour, and when the video ended and she rejoined our group she was costumed in a black cape and wide-brimmed hat that mirrored the cape and hat worn by the iconic figure that adorns each bottle. That set the tone for our walk through the production facility, where we had a chance to see how port is made. 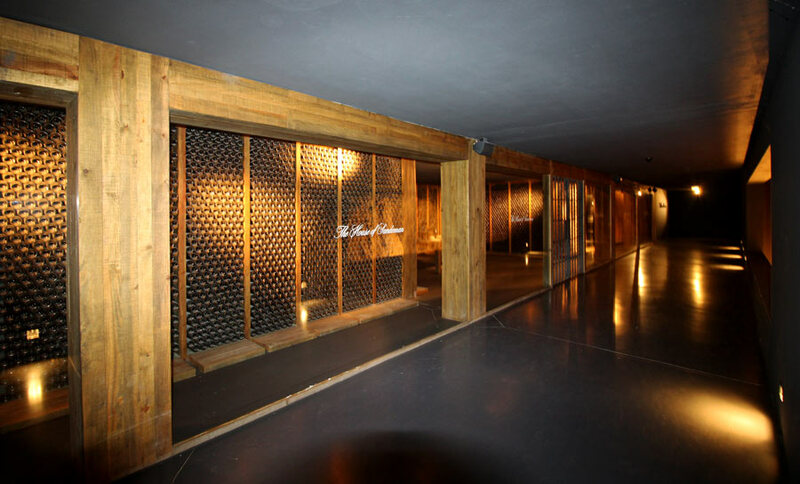 The process is not unlike how less sweet wine is produced, so we were already quite familiar with what our guide showed us, but it’s always interesting to see how wineries outfit their facilities. When the tour was over, we had a chance to try two generous pours of two different ports: a white and a ruby. The white was my favorite; it was fresh but sweet with notes of peach and vanilla. Still grappling with how port could come in a white variety (which we learned the day before when visiting Taylor’s in Porto), I immediately liked it. The ruby was big and rich but tasted quite a bit like strawberries to me, so while I didn’t outright dislike it I wouldn’t have purchased a bottle. Strawberry wines remind me of rosés, which I don’t often enjoy. When our glasses were empty, we excused ourselves from the table we shared with our fellow tourists (who, inexplicably, were still talking about their scandalous vacation nights) and slipped outside to take a few pictures until it was time to move along to lunch. We also had a chance to chat a bit with our tour guide, who confided that he was late to pick us up because he waited 15 minutes for the College Friends to emerge from their hotel room earlier that morning. I told him it was nice of him to wait for them when he could have just left them behind. “Not all tourists make your day easy,” he said with a bit of a smile. We had a nice meal at Restaurante Segredos do Douro, which was packed with locals and served us salad, pork cutlets, and fresh fish family style along with both red and white wine. The meal itself was simple but hearty, a nice pause during a day full of wine tasting, and it gave us a chance to chat a bit with another couple from the USA who was traveling through Portugal. We were somewhat grateful that the College Friends had moved beyond their more risqué discussions and were now focused on their frustrations over our meal’s lack of poultry options. Adam and I shared a smile over this. The road to our next stop took us past a sight that had become familiar to us after a week in Portugal: cork trees, which are the source of the corks found in wine bottles. I had absolutely no idea that cork came from trees; I had never really considered where cork came from, actually. 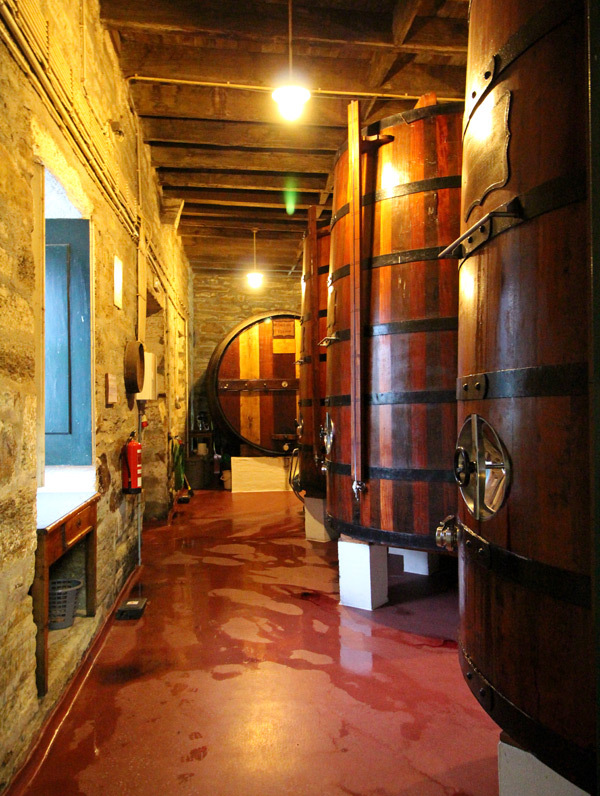 About a third of all cork in the world is produced by trees in Portugal. The trees are planted, and when they are about 25 years old cork can be cut from them for the first time. After the first cutting, cork is harvested every nine years. It’s a very sustainable industry since the cork reproduces naturally over the course of a decade. 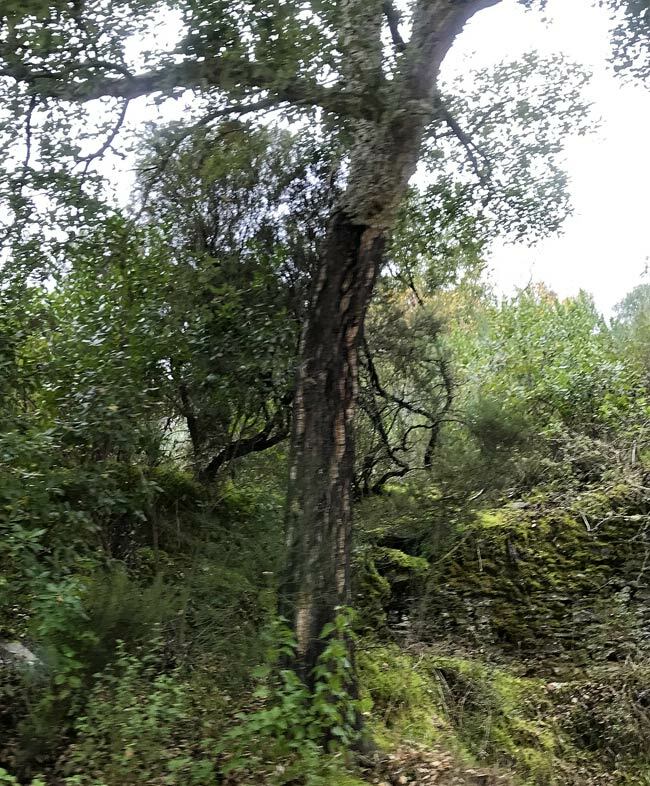 We saw cork trees almost everywhere we visited in Portugal, but it seemed most appropriate when they popped up in the middle of our wine tour. 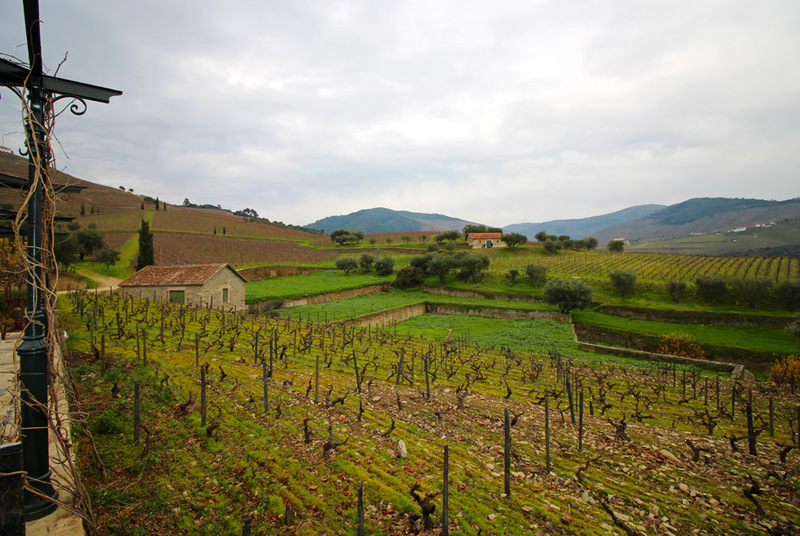 Our second stop took us to Quinta de Roêda, home to Croft Vineyards, where we had the chance to tour outside to see the vineyards where the grapes are grown. 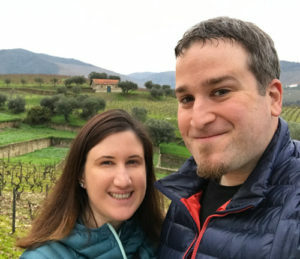 We visited on a cold, blustery day, so our tour didn’t last long, but even in the middle of winter it was easy to appreciate the expansive estate where the grapes are grown. Back inside, we sampled four different ports. The first port we tried was a rosé, which again was a new experience for us—not only can port be white, it can be pink, too! The rosé is lighter than the other ports we tried, which was intentional; Croft specifically set out to create a port that would be suitable to drink during warmer months. It was full of red fruit flavors like raspberries, strawberries, and cherries, and while rosé is almost universally my least favorite wine on any tasting menu, I thought this one was well balanced. With more space in my luggage I might have even considered a bottle! Next up were a ruby and two tawnies. 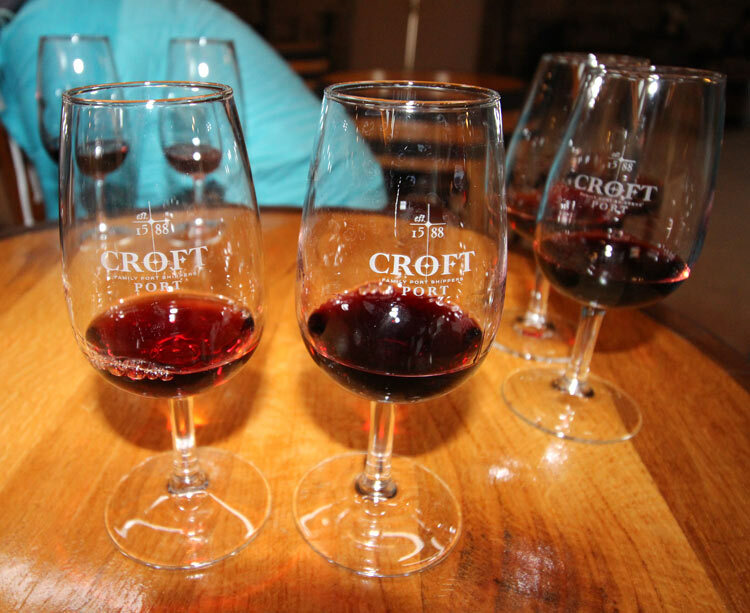 Croft provided us with a lot of information on the difference between ruby ports and tawny ports; notably, ruby ports have shorter aging periods in the barrel, so they tend to be sweeter and deeper in color. Tawnies age longer and are less sweet but more smooth. This was noticeable when we compared the remaining ports on our tasting menu. Croft’s reserve port is a ruby, and it was heavier and very sweet. The 10-year tawny we tried right after was much lighter in color, smoother on the palate, and not quite as sweet. Surprisingly, although I have a sweet tooth, I found I preferred the tawny to the ruby. We finished with a taste of their 20-year tawny, which was the best of all of them; it had a similar sweetness but was even silkier and easy to drink. There was no disagreement when it came time to pick a bottle to bring home; we easily settled on the 20-year tawny. 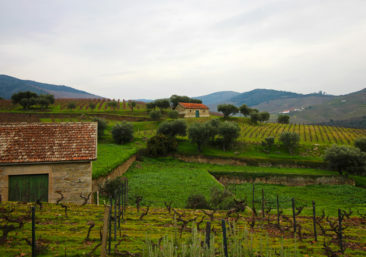 Our final stop of the tour was at Quinta do Panascal’s Fonseca Vineyards. 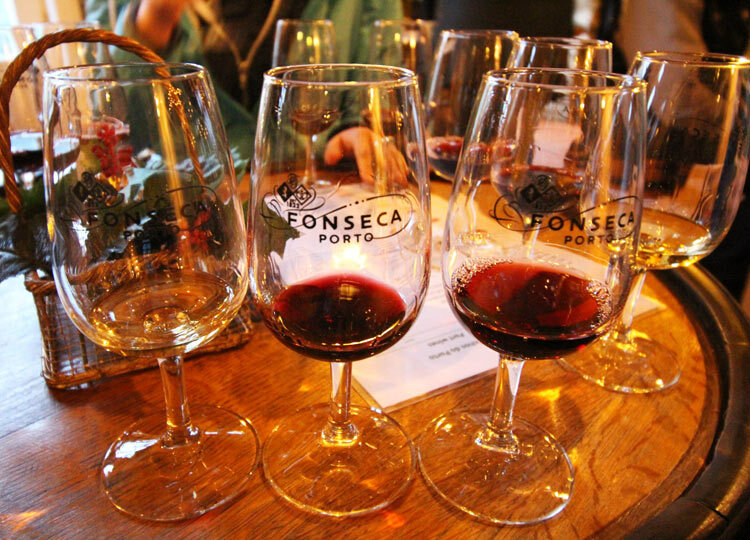 Fonseca’s ports date back to the mid-1800s, so they are well established in the Douro Valley and produce some very high-quality wines. 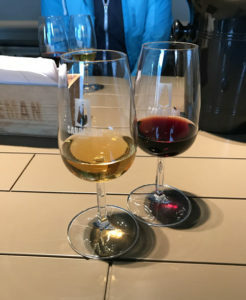 We tried a white port, a ruby, and a tawny, and each of them was fruit-forward but nicely balanced. We ended up purchasing a sampler pack of five different ports; we couldn’t decide on a single bottle and didn’t have the luggage space for more than one, so our compromise was to bring a little bit of each of them home with us. 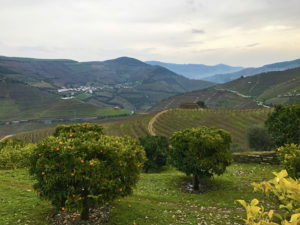 We left as the sun started to set, leaving us with a few moments to admire the beautiful Douro Valley landscape for the final time during our trip. With that stop, our tour concluded, and we headed back toward Porto. Mercifully, the ride home was quiet as almost everyone slept; it wasn’t until the final 15 minutes of our ride that the College Friends awoke and began to consider all of the new ways they could cause trouble that night. It didn’t break my heart when they climbed out of the van and disappeared into their hotel. Over dinner that night, Adam and I chatted about how refreshingly educational the day had been. We’ve taken many wine tours and sampled wine all over the world, but neither of us knew very much at all about port. Learning about the different types of port helped me to recognize that I have a strong preference for tawnies, so in the future I’ll be better equipped to select a port I’ll enjoy instead of steering clear of them entirely. We ended our trip feeling a bit more cultured than we did when we arrived! We really liked the Mercure Porto Centro Hotel. 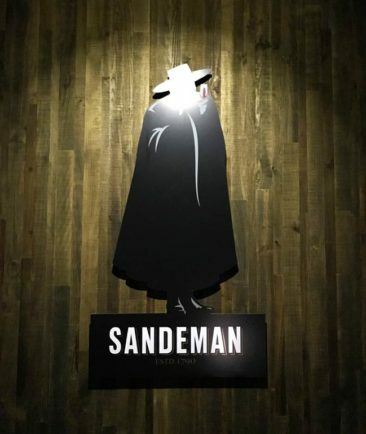 Located within a short walk of two metro stations (Bolhao and Sao Bento), we loved that we could walk everywhere from that location. The rooms were really nice: the bed was really comfortable, the shower had great water pressure, and our room was very quiet at night which made sleeping easy. 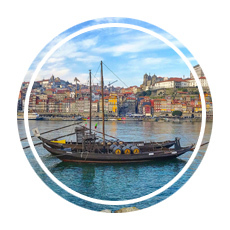 Visit Porto and the Douro Valley! Visiting the Douro Valley for a day left us wanting to plan a return trip right away. 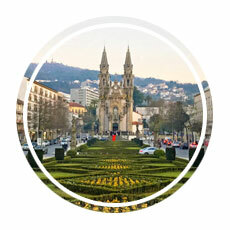 Like our visits to Lisbon, Sintra, and Braga and Gumarães, we loved exploring such a beautiful part of Portugal. 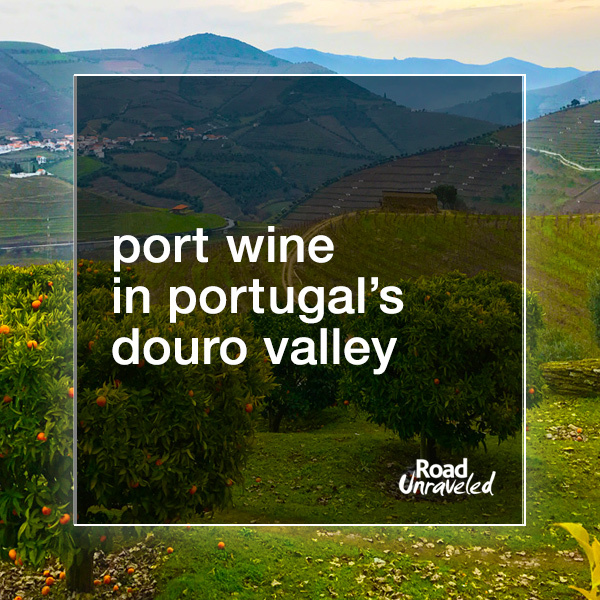 It won’t be long before we open one of the bottles of port we brought home—and we hope it won’t be long before we find ourselves back in Portugal’s historic port wine country. Next time, though, we’ll hope the College Friends are on a different tour. 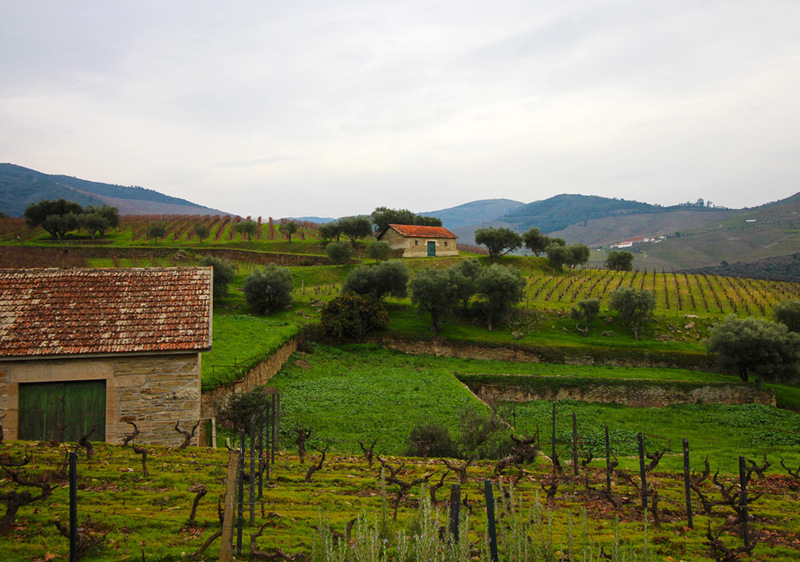 Are you visiting the Douro Valley? 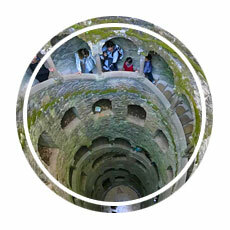 Check out these posts for additional places to include on your trip to Portugal!